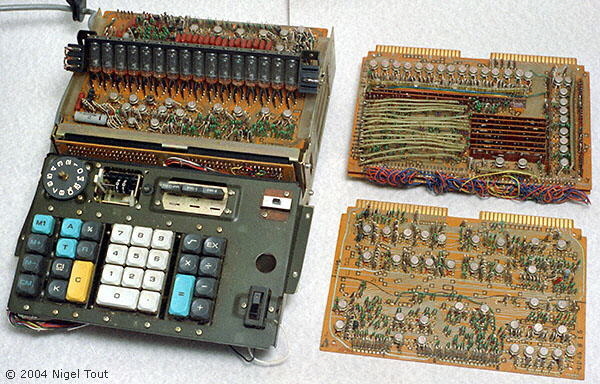 Distinctive features: Programmable calculator employing about 100 integrated circuits. 16 digit display using Nixie-type tubes. 30 steps programmable, 4 function, %, 2 memories, square root. Has 4 logic boards holding 100 ICs in cans (Toshiba TM4004/5/6, 103/5) & 82 transistors. Uses 30 KHz clock. 300 mm x 390 mm x 140 mm, (11.8" x 15.4" x 5.5"), 5.4 Kg (11.9 lbs.). In Oct 1969 this model was advertised at a cost of GBP £598 (about US$1,400). 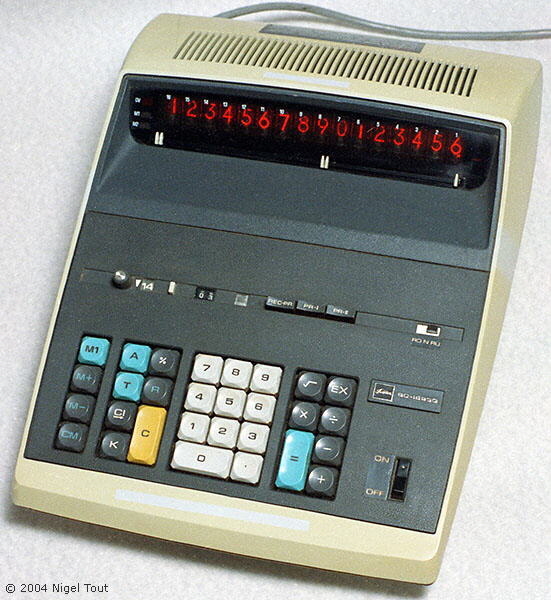 Toshiba manufactured a small number of models of desktop and hand-held electronic calculators, and also manufactured calculator integrated circuits. With the casing and the keyboard (on the left) removed. 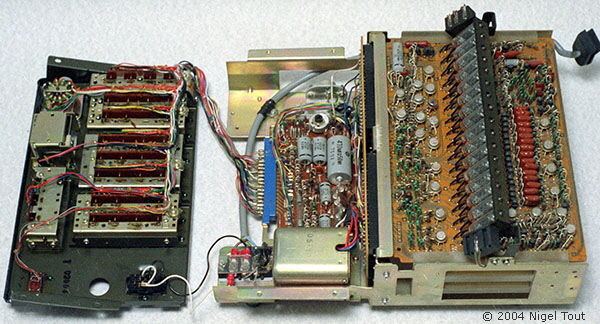 This shows the power supply in the centre and the rack holding the four circuit boards on the right, with the display tube assembly along the top board. The keyboard has been replaced and three of the circuit boards have been removed from the rack. Two of the circuit boards, at top right, are linked together and are joined using screws and spacers. 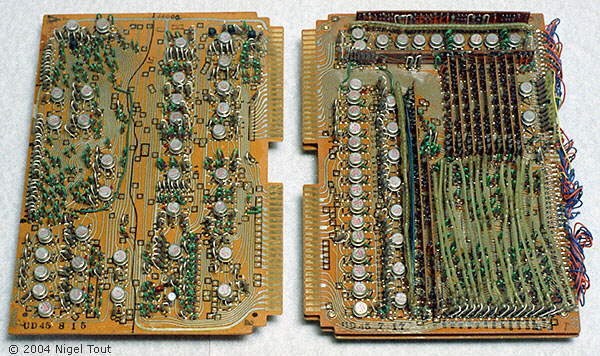 Two of the four circuit boards. The metal cans are some of about 100 Toshiba integrated circuits. The board on the right is linked to the board underneath it. It has a dozen small vertically-mounted daughter boards each holding electronic components, which allows more components to be squeezed onto the board. Management in Action, October 1969, p58.